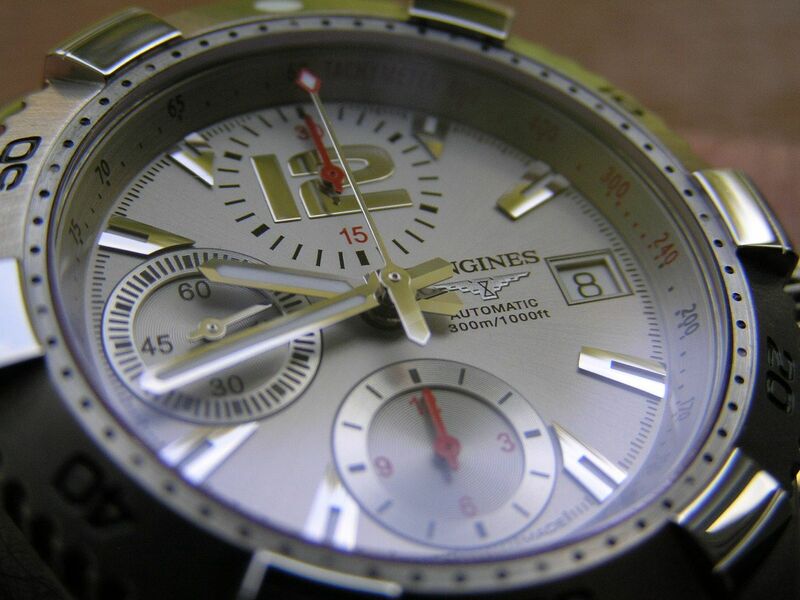 The Longines Hydroconquest line of dive watches has been a popular and well-received series for several years already. 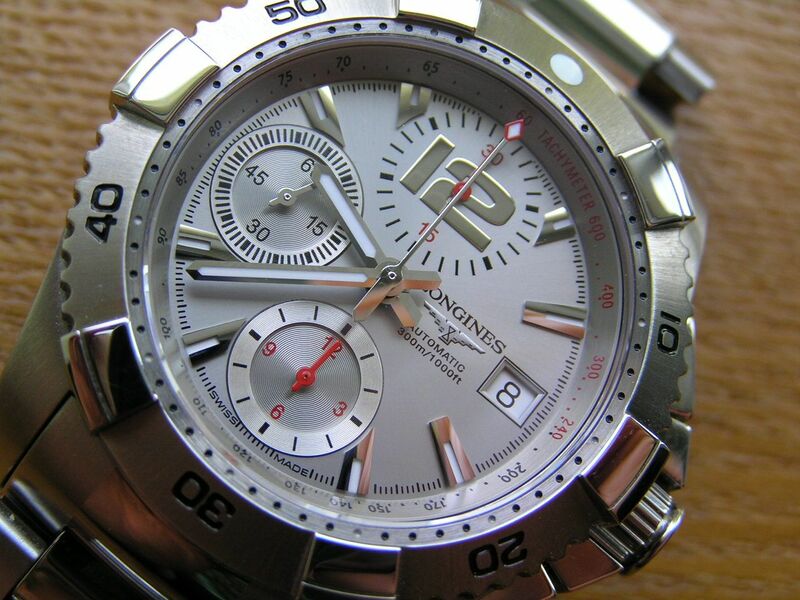 The Hydroconquest models come in standard and chronograph types, with both quartz and automatic movements. A variety of dial colors are available as well. Some design tweaks have also occurred to the line up, with different style bezels and hands on some models. I was longing for a Hydroconquest, but felt the standard models left something to be desired. 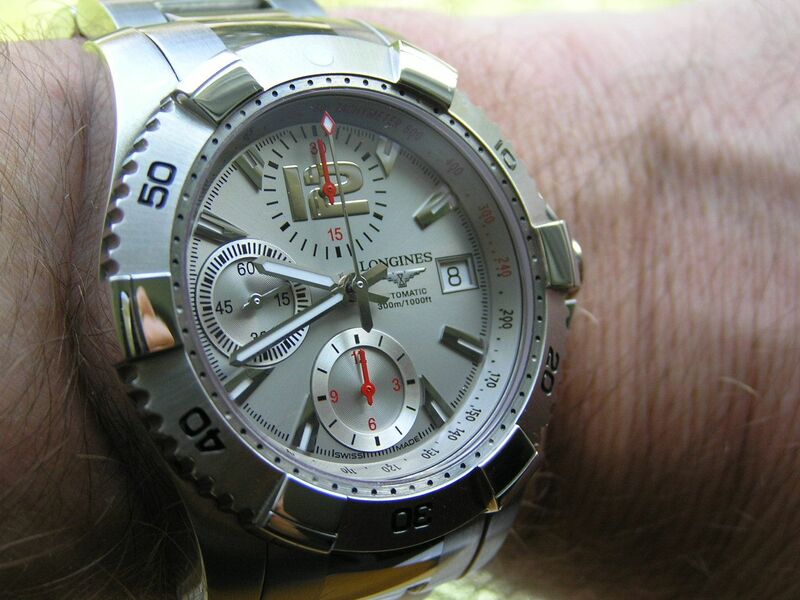 When a good WIS friend of mine offered up his Hydroconquest chronograph for sale, I took another look at this watch and decided I couldn’t live without it. 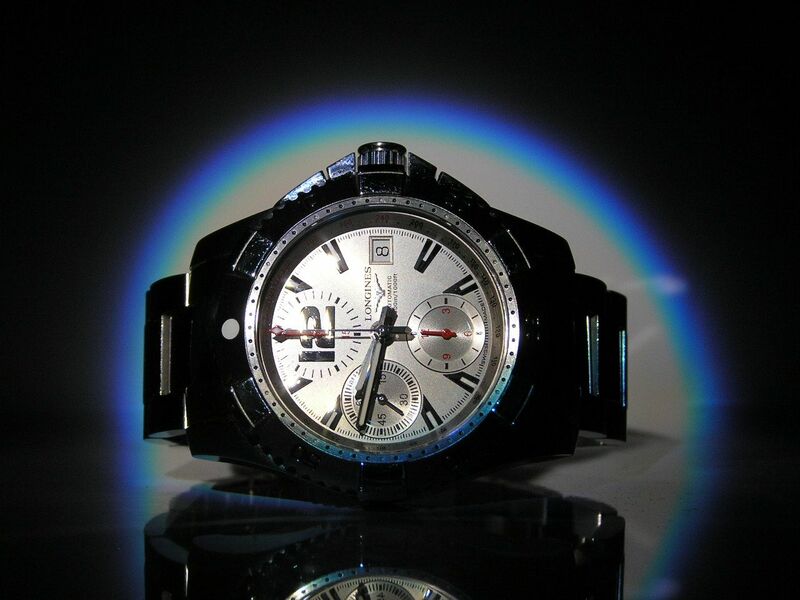 If you haven’t considered a Hydroconquest chrono, I suggest you take a good, long look at it, you won’t be disappointed. This Hydroconquest starts with a somewhat chunky polished and brushed stainless steel case which measures 42mm without the nifty signed crown; 46.6mm with the crown. 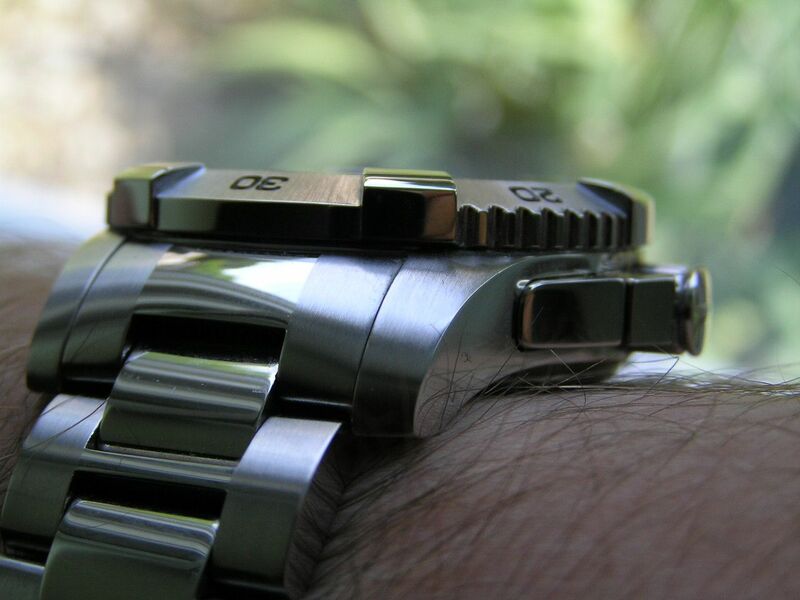 Even so, with the longish crown, this watch does not wear big, more like a 40-41mm piece. Lug spacing is 21mm, case thickness is 15.5mm, about standard with the Valjoux 7750 engine. 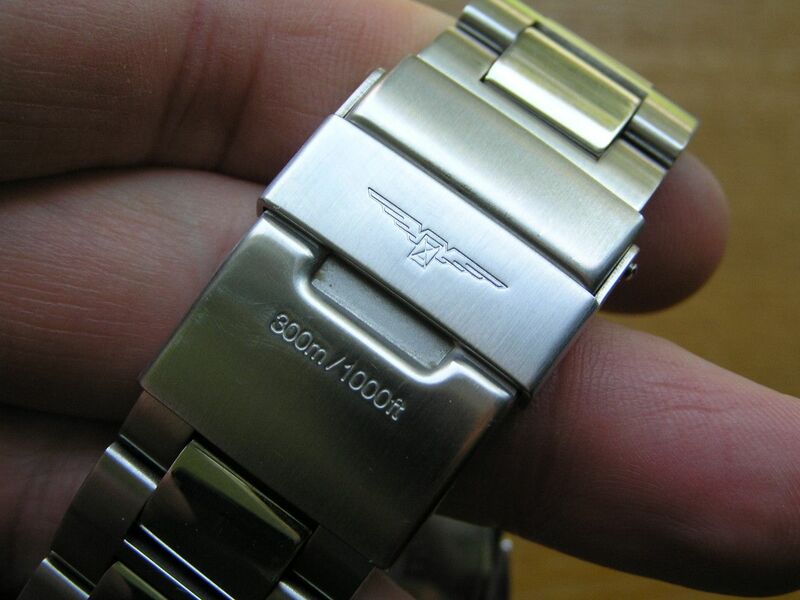 The screwdown case back is deeply engraved with the Longines ‘wings’ logo and is satin finished. It looks superb! The Hydroconquest is factory rated at 300 meters of water resistance. 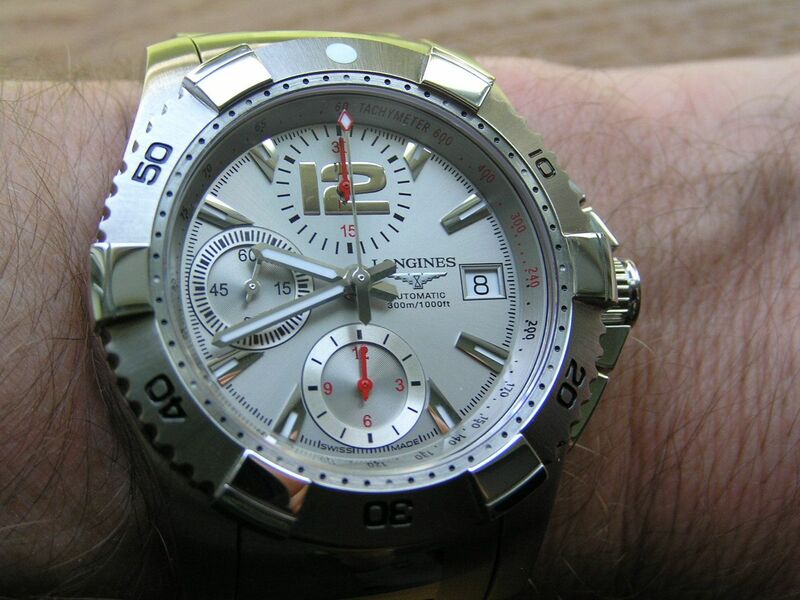 Powering this fine watch is the aforementioned Valjoux 7750 automatic chronograph movement. With 25 jewels, chronograph timing in one-second increments up to 12 hours and a quickset date display @ 3, this workhorse of a movement is the perfect choice for this rugged, yet sporty, diver. With a power reserve of at least 42 hours and excellent timekeeping (running at -2 seconds over 24 hours under my supervision), this movement is a gem. Chrono accuracy is fine and the pushers work crisply to activate, stop and reset the chrono functions with ease. Of course, this movement hacks and manual winds. The subdial @ 12 is the 30-minute chrono totalizer, while the subdial @ 6 is the 12-hour chrono totalizer. The subdial @ 9 is the seconds hand for the watch. The chrono second hand is tipped in red for easy viewing, while the chrono subdials have their hands in red as well. I wasn’t sure how this would work, but believe me, the red makes it very easy to read the chrono timing at a glance, especially against the silver dial. 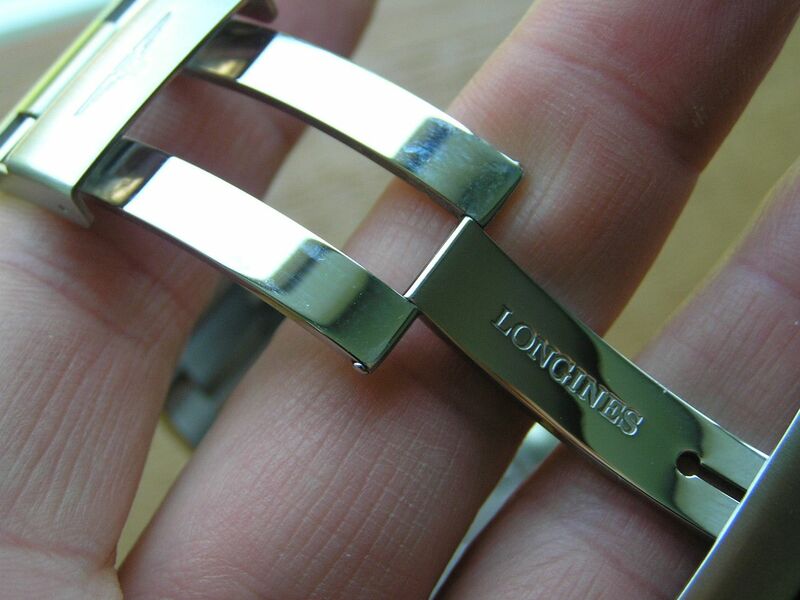 Interesting to note, each subdial is designed a bit differently, the 30-minute totalizer has simple black hash marks for each minute while the 12-hour totalizer has a silver outer ring raised slightly above the center portion of the subdial. The seconds hand subdial has a silver outer ring as well, but graduated into one-second increments, so it looks finer, with darker markers at each five second position. 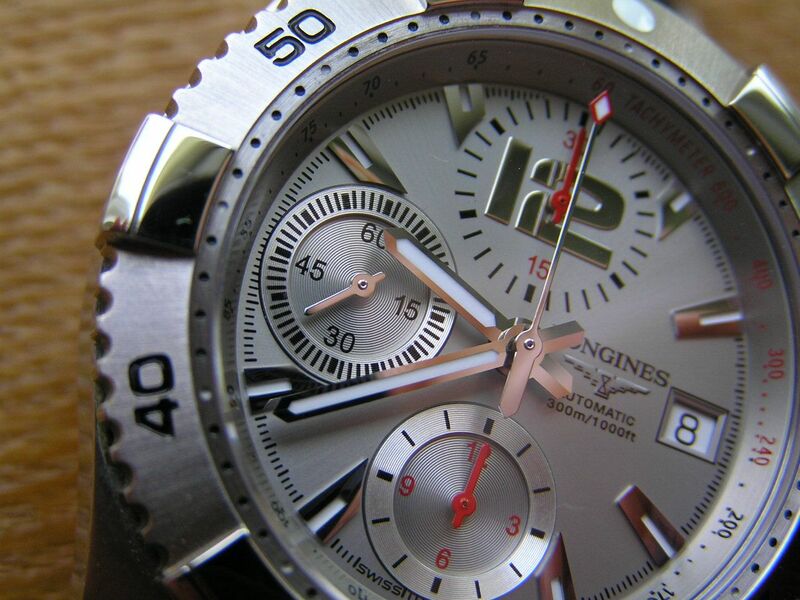 The dial is a sort of matte silver with applied silver markers with inset lume. The hands are basic stick style, silver with inset lume. 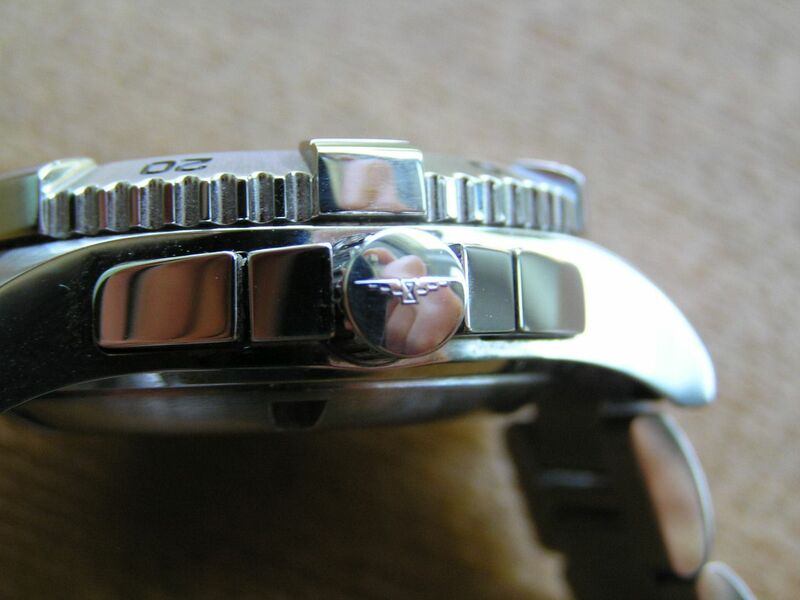 The small silver seconds hand does not have any lume, so using this watch as a ‘real’ diver would not be advised. An oversized silver ‘12’ arabic is of course, at the 12 o’clock position smack dab in the middle of the subdial at 12 and is really the only garish design element of this watch. It’s really not so bad once you start wearing the watch, but at first, it just jumps out at you and seems out of place. There’s also a deep dish style tachymeter that forms the chapter ring on the dial but it’s really quite subdued and you almost don’t know that it’s there. Of course, a sapphire crystal caps the dial and is perfectly flat with no noticeable anti-glare coating on it. Lume quality for a diver could be a bit better. 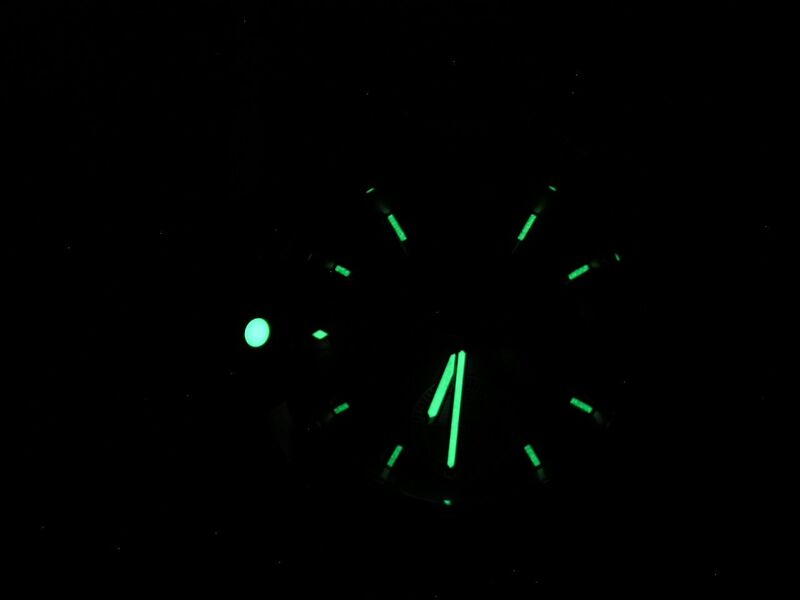 It’s reasonably bright, but the amount of lume used on the markers and hands is quite narrow, so it just doesn’t jump out at you like some other dive watches do. 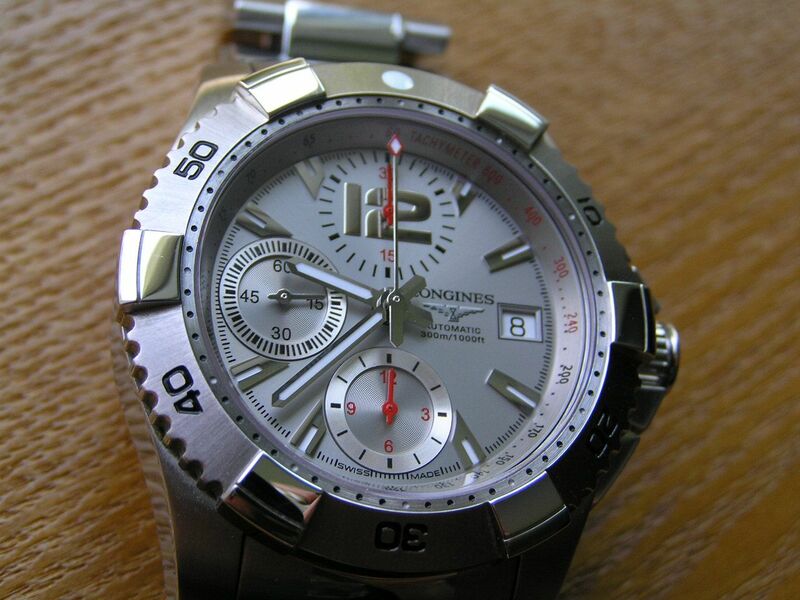 Two cool design elements of this watch are the crown and chrono pushers. The crown has horizontal grooves as the knurling with a sort of cap machined into the end, which forms a lip of sorts that makes it easier to pull out the crown when setting or winding. 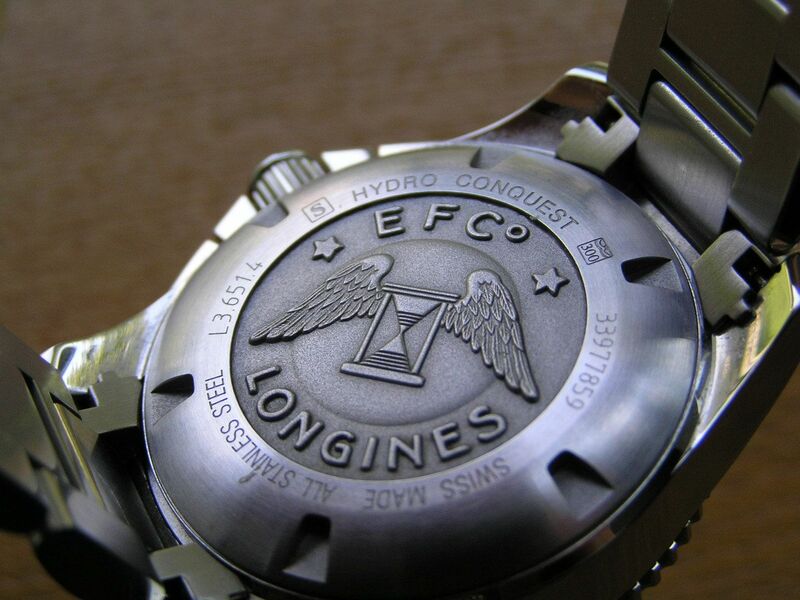 The crown is signed with the Longines ‘wings’ logo. The crown screws down with a satisfying three turns minimum but can be a bit hard to pull out all the way when setting the time. The pushers are almost invisible, as they are an extension of the crown guards. The pushers are triangular in shape and fit fairly flush with the case side, so they are not obtrusive in any way. I like this design and feel it gives a modern touch and a certain grace to this watch. 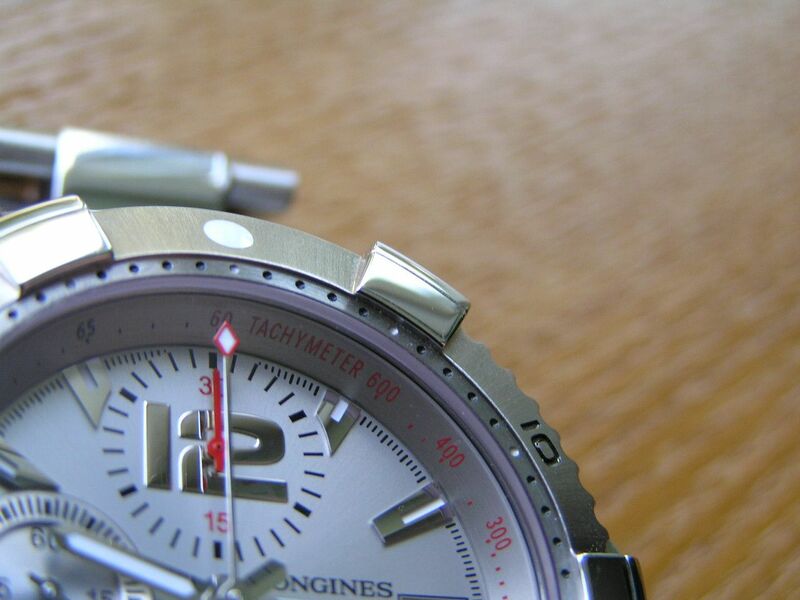 The bezel is a unidirectional 120-click affair with a brushed finish and painted in numbers at the tens. There are polished pieces of metal that protrude upwards at the fives on the bezel, sort of like molded-in rider tabs ala Breitling. I at first thought these tabs looked too chunky and clunky, but again, after living with the watch, they don’t really distract and allow for easy operation of the bezel itself, which is smooth and even with just the smallest amount of play. 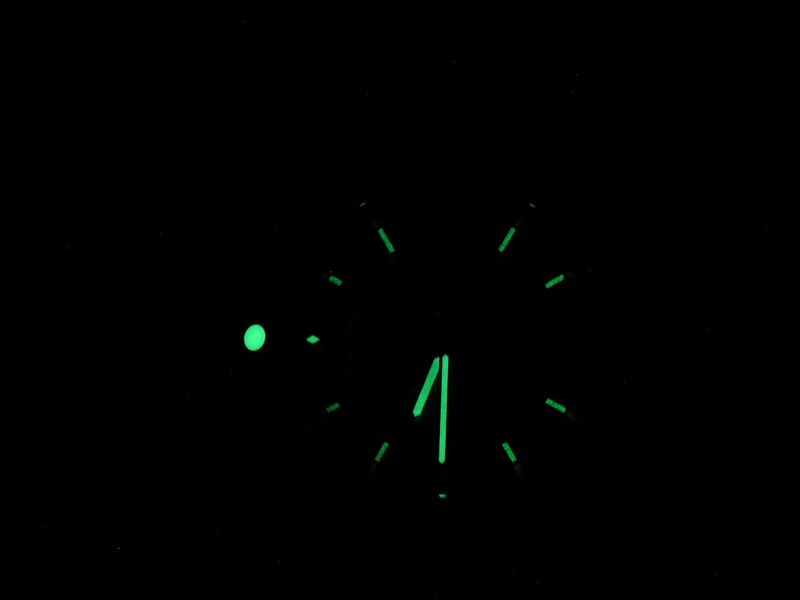 A very plain looking lume pip is almost flush fit with the bezel at 12. 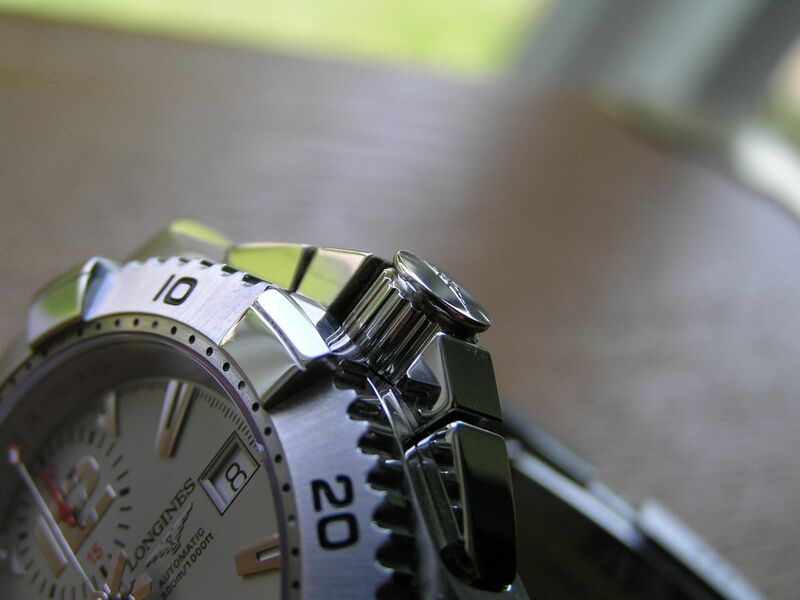 The bracelet on the Hydroconquest chrono is pretty much an oyster style solid link type with brushed outer links with polished edges and polished inner links. 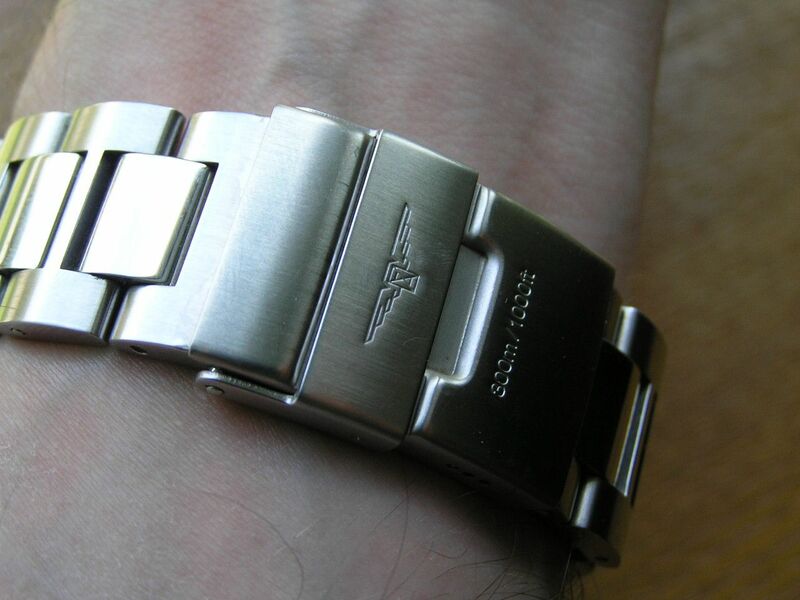 Solid end links, a double locking signed clasp, a polished machined deployant and a stamped steel diver’s extension complete the bracelet’s presentation. There is no taper to the bracelet, running 21mm from lug to clasp. 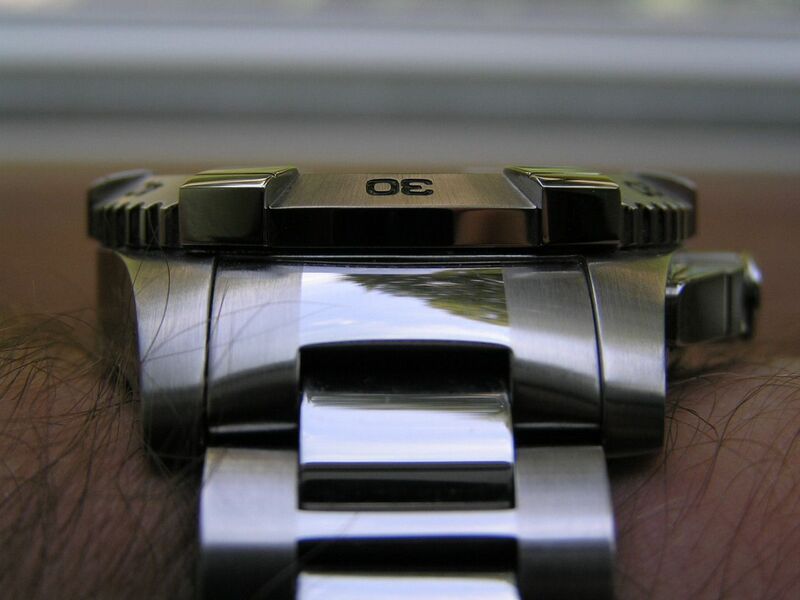 This watch, despite being rather thick and with the added thickness of the bezel tabs, wears quite well. The diameter of the dial itself is 33.3mm, so as stated previously, it wears smaller than its actual physical size. Overall fit and finish is great, with a clean assembly and a clear dial under 8X loupe examination. 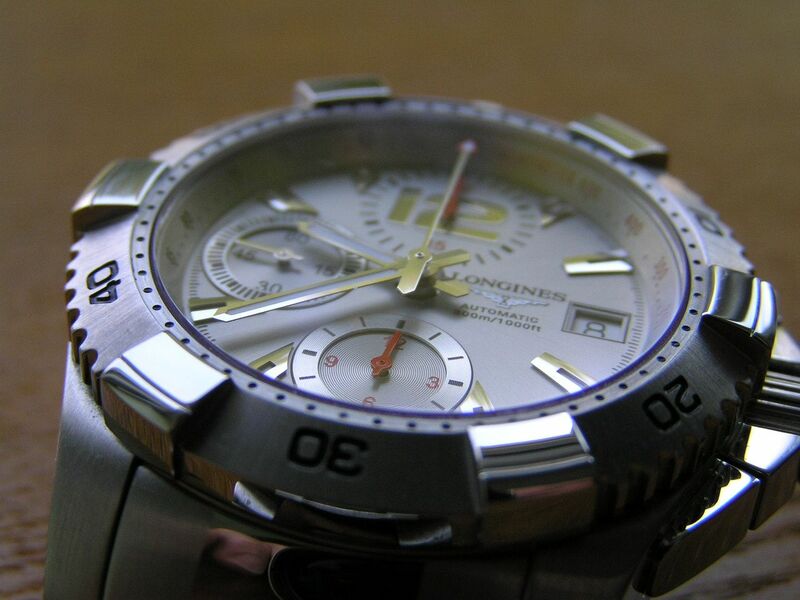 The Longines Hydroconquest chronograph is a very useful, good looking watch that comes in enough flavors to please most dive watch enthusiasts. Add in its Swiss heritage, good value pricing (especially when bought at a discount) and solid, quality construction and you have a watch that can go the distance. I've been wearing this watch for the past 7-8 years and it's still going strong and till today I still wear it proudly as if I just owned it new.